Aluminium sulphate, also called alum, became an industrial product in the 19th century made by Parr at the Vitriol works on Mynydd Parys. It was made by treating a fine clay like substance called argillaceous earth, which was found on Mynydd parys with sulphuric acid. Two methods were employed. In the first a clay like earth found on Parys mountain was simply mixed with acidic water. In a second process this earth was laid over the top of copper ores as they were calcined in the kilns and the sulphuric acid fumes adsorbed. After the first stage the treated earth was taken to shallow pits were it was stirred with water. The resulting alum solution was filtered and then concentrated by gentle heating where the crystalline material formed naturally. The plant was able to produce 1 ton of alum per week. Unlike true alum, aluminium sulphate could not be conveniently purified through recrystallization because of its greater solubility in water. This is one of the reasons why it often contained varying proportions of silica, iron and free sulphuric acid. The alum prepared by Joshua Parr was used in the production of dyes and pigments as well as in tanneries where it was used to dress leather. Much of the produce of the work was exported via Caernarfon to America. Take an exact troy ounce of the ore, previously pulverized, and calcine it well; stir it all the time with an iron rod without removing it from the crucible; after the calcination add an equal quantity of borax, 1/2 the quantity of fusible glass, 1/4 the quantity of pitch, and a little charcoal-dust; rub the inner surface of the crucible with a paste composed of charcoal- dust, a little fine powdered clay, and water. 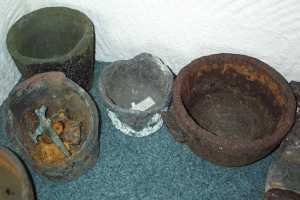 Cover the mass with common salt, and put a lid upon the crucible, which is to be placed in a furnace. The fire is to be raised gradually till it burns briskly, and the crucible continued in it for 1/2 hour, stirring the metal frequently with an iron rod; and when the scoria which adheres to the rod appears clear, then the crucible must be taken out and suffered to cool, after which it must be broken and the regulus separated and weighed. This is called black copper; to refine which equal parts of common salt and nitre are to be well mixed together. The black copper is brought into fusion, and a teaspoonful of the flux is thrown upon it which is repeated 3 or 4 times, when the metal is poured into an ingot mould and the button is found to be fine copper. The collection of a representative sample of ore for assaying was an important duty as was the safe delivery of the samples to the assay office. Each group of miners would take samples from the ore they were removing from the mine and put them to one side. A sample of this ore would then be taken by a mine official and locked in a wooden box, which was placed in a locked wheel barrow for its journey to the assay office. It is also called “bluestone”, “copper vitriol”, and “flower of copper”. The beautiful blue colour arises from water molecules attached directly to the copper(II) ion. The water/copper ion complex absorbs photons of yellow or red light. Absorption of a photon promotes an electron from the water to the copper(II) ion. Since only yellow or red light is absorbed, blue light is transmitted, and the crystals appear blue. If blue crystalline CuSO4·5 H2O is heated strongly, the hydration water is driven off, leaving white powdery CuSO4 (“anhydrous” copper(II) sulphate). The blue will reappear if the anhydrous copper sulphate is exposed to even small amounts of moisture, making it sometimes useful as a spot test for water. Doctor Joshua Parr set up the Mona Vitriol company close to Trysglwyn Isaf in around 1803 initially to extract Copperas but soon changed to making Blue vitriol from the mine water. This venture failed due to the presence of impurities especially Iron in the mine water. This material is Hydrated Ferrous Sulphate ( FeSO4.7H2O) it was also known as Green vitriol. In 1579 the Society for the Mineral and Battery works, commissioned a Mr Medley to study a stream which issued from the mountain. He added iron to the water and boiled it over a turf fire. The solution was allowed to cool and separated out into 3 layers. The top layer was Copperas with Alum in the second layer and on oxide of iron at the bottom. The material was used in the manufacture of inks and pigments. However, Joshua Parr could not remove the iron oxide from the material and so could not interest the ink and pigment manufactures. Joshua Parr also attempted to use the copperas to make sulphuric acid for which a market was just beginning to develop. However, his efforts in this way were stopped when a process for making sulphuric acid direct from sulphur was discovered and pursued by the mining companies. The Mona mine supplied a large amount of natural material which ” contains sufficient amount of oxide of iron to make it an effective purifier and enough organic material to render if sufficiently porous to secure an easy passage of gas”. The material was the first to be used by Frank Clarke Hills to produce gas purification material. Records from the end of the 19th century show many cargos of material leaving Amlwch Port for use throughout Britain and the continent. Amlwch Gas and Chemical co were supplying the shops and houses of Amlwch with gas light from 1869. Lime is produced by roasting limestone in a kiln. 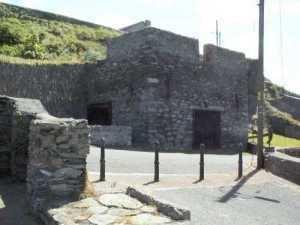 An example of one of these kilns can still be seen at Amlwch port. During the days of sail many ports had a lime kiln. The reason being was that the raw limestone made an excellent ballast for ships who could unload it for profit before picking up another cargo. The lime was used as a soil conditioner and in mortar for building. However, at Amlwch it was also an essential part of the smelting process. One of the processes used on the mountain to recover the copper was the precipitation process. Once the mine waters had been reacted with iron in a number of pits the main material left in solution was Iron Sulphate. Drying the solution produces green vitriol: blue-green crystals of FeSO4·7 H2O. Iron(II) sulphate is used to make writing inks and dyes by reaction with “tannic acid” (a complex mixture of organic acids extracted from tree bark), followed by air oxidation to make intensely blue-black iron(III) tannates. Further oxidation lead to Iron Oxides or hydroxides. The best known reaction of iron is rusting, in which iron reacts with oxygen and water to form red hydrated Fe2O3. The colour of dried Fe2O3 is intense, and it is used as a red pigment in pints, rubber, ceramics, and glass. Air oxidizes iron(II) salts to iron(III), and the crystals are soon crusted with brown iron(III) hydroxides and sulphates. The Iron oxides and sulphate at various states of oxidation were allowed to precipitate out in long shallow pools on the mountain. Initially a golden yellow coloured material was formed. The longer the oxidation process was allowed to carry on the darker the solid material became. When the remaining liquor was drained off the material known as ochre was collected and dried. The material was then taken down to the St Eilian Paint Colour Works in Amlwch port. (SH449 913) Here the solid was ground between two stone wheels 26 ” diameter and 12″ thick with round edges and bevelled sides.to make pigments used in the manufacture of paints. Wind power was used to turn the stones. In 1850 The proprietor of the Colour works mill was Mr Richard Parry and colours ranging from ochre, Venetian Red and Umbre are listed. Owned by Mr John Parry in 1866. An advertisement from 1889 describes the finished material as “strong, brilliant yellow, soft and free from impurities”. The golden hue presented by the paper hangings of the best makers in England. This is an impure form of Sodium Sulphate which was eventually produced at Gwiath Hills. Made by the reaction of Sulphuric acid on common salt. Resulting in the evolution of large quantities of Hydrochloric acid fume. This was produced by the mine companies using kilns on the mountains. One area of the mountain is still called the Brimstone yard. The copper ore was greatly improved in quality by the removal of the sulphur which then made carting and smelting more economic. Initially no attempted was made to collect the sulphur dioxide gas which was evolved during the calcining process. By 1778 John Champion had agreed to calcine the Parys mine’s ore free of charge in return for the sulphur which was produced. Champion’s process was a batch process using horizontal ovens. The sulphur was sublimed and collected as “flowers of sulphur” in a separate chamber. The crude sulphur was then re-melted and formed into cakes. In 1778 Mathew Boulton visited the mountain and described a continuous method of production which was also in use. He stated that the 3000 tpq sulphur was cast into cylindrical shapes which were exported from Amlwch to make Vitriol. By 1800 Lentin described 35 feet high vertical brick or stone built conical sulphur kilns at the mountain and down in Amlwch port. Each of the 45 kilns could process 10 tons of ore a week to give around 1 1/2 tons of sulphur. This amounts to around 3500 tpa. This was produced by the Parys Mine company at its Cae’r Pandy works some time before 1799 probably from the copperas solutions from the mountain. However, the availability of large amounts of sulphur from the mountain at the end of the 18th century made it more economical to send sulphur to a new works in Liverpool. The Garston Sulphuric acid works was formed in 1792 Much of the acid was sold to the Pen Maes company who sold it on to the developing textile and pharmaceutical industry. The method use was the lead chamber process. Sulphur was burnt to produce sulphur dioxide. This was further oxidised using moist air using gaseous nitrogen oxides as catalyst. The nitrogen oxide were formed by the burning of potassium nitrate. The reactions took place in a series of lead lined chambers in a process called the Lead chamber process after John Roebuck. The connection between Mynydd Parys and sulphuric acid manufacture was re-established in 1840. In that year Mr Charles Henry Hills was attracted to Amlwch by the cheap and abundant Sulphur supplies. He located a works on the Llam carw headland and developed the direct pyritic process to produce sulphuric acid. This is a type of contact-process plant which produces sulphur dioxide from low-grade, sulphur-bearing materials, such as pyrite. Cooling of the gas is necessary to remove impurities and to condense and remove part of the water vapour, which would dilute the acid product. The sulphur dioxide gas is then dried with concentrated sulphuric acid forming more sulphuric acid. For C.H Hills the main use for this sulphuric acid was to produce fertilizers. Around 1860 Hill’s offered to build a new works which would make sulphuric acid direct from the Mona mine ores. This would appear to have been built in Upper Quay street with the sulphuric acid running direct to the fertilizer factory at Llam carw. When the output from the mines started to diminish crude sulphur was imported into Amlwch. In January 1887 the French brig Edmond brought a cargo of Spanish sulphur into the port. In addition, ground phosphate was brought in from Antwerp. Zinc sulphate which was said to be made by Parr at the vitriol works in a report published in 1828.